Figure 6. Generalized geologic units that compose (blue shading) and underlie (gray shading) the High Plains aquifer (Modified from Gutentag and others, 1984). (Click image for larger version). The geologic units that make up the High Plains aquifer and the underlying bedrock units range in age from Permian to Quaternary; Figure 6 is a diagram showing the geologic age and thickness of these geologic units. The composition of the bedrock units that underlie the High Plains aquifer includes siltstone, shale, loosely to moderately cemented clay and silt, chalk, limestone, dolomite, conglomerate, claystone, gypsum, anhydrite, and bedded salt. The composition of the units that compose the High Plains aquifer includes poorly sorted clay, silt, sand, and gravel, generally unconsolidated, deposited by streams and wind (Ogallala Formation and Quaternary units), very fine to fine-grained sandstone (Arikaree Group), and siltstone containing sandstone and interconnected fractures (upper part of the Brule Formation). See USGS Professional Paper 1400B for further information on the geologic history and setting of the High Plains area. Figure 7. Principal geologic units that constitute the High Plains aquifer (Modified from Gutentag and others, 1984.) (Click image for larger version). 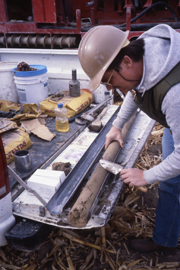 In most of the aquifer area, the Ogallala Formation of Miocene age and overlying hydraulically connected Quaternary deposits, if present, are the principal geologic units in the aquifer. In northwestern Nebraska, south central South Dakota, and southeastern Wyoming, the fractured part of the Brule Formation or the Arikaree Group, is the principal geologic unit. In eastern Nebraska and south central Kansas, Quaternary deposits are the principal geologic units (figure 7). The altitude of the base of the aquifer (top of the bedrock units) ranges from about 6,000 to 1,200 feet above NGVD 29. The percentage of the aquifer that is directly underlain by each bedrock unit varies—Permian age rocks (12 percent), Triassic and Jurassic age rocks (16 percent), Lower Cretaceous age rocks (12 percent), Upper Cretaceous age rocks (32 percent), and Oligocene age rocks (29 percent) (figure 8). The water table, the upper boundary of the High Plains aquifer, ranges in altitude from about 6,000 to 1,200 feet above NGVD 29. A contour map of the water table shows groundwater flow direction is generally from west to east and locally toward streams (figure 9). The average groundwater flow velocity in the High Plains aquifer is about 1 foot per day (Gutentag and others, 1984). Depth to water is the difference between the altitude of land surface and the altitude the water table. The generalized depth to water in the High Plains aquifer in 2000 ranged from land surface to more than 300 feet below land surface (figure 10). Water-level changes in the High Plains aquifer from predevelopment to 2013 (McGuire, 2014) are based on water levels from 3,349 wells. The water-level changes from predevelopment to 2013 ranged from a rise of 85 feet in Nebraska to a decline of 256 feet in Texas (figure 11). Water-level changes from predevelopment to 2013 were declines of 5 feet or more in 37 percent of the aquifer area, rises of 5 feet or more in 11 percent of the aquifer area, and between a decline of 5 feet and a rise of 5 feet in 52 percent of the aquifer area. Figure 8. Geologic units underlying the High Plains aquifer and altitude of the base of the High Plains aquifer. Modified from Weeks and others, 1981. (Click image for larger version). Figure 9. Predevelopment water-table altitude and direction of groundwater flow in the High Plains aquifer. From Gutentag and others, 1984 (Click image for larger version). Figure 10. 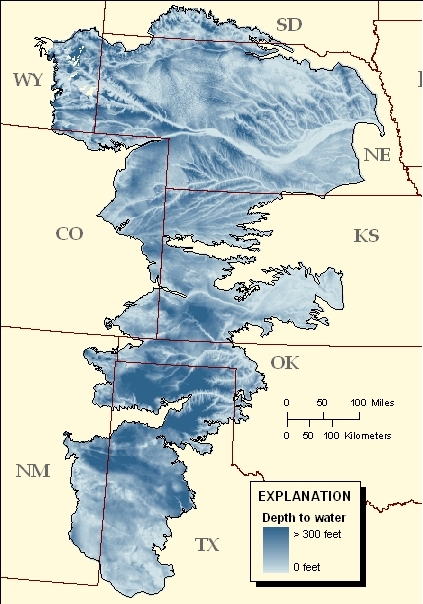 Depth to water in 2000 in the High Plains aquifer. Modified from McMahon and others, 2007. (Click image for larger version). Figure 11. 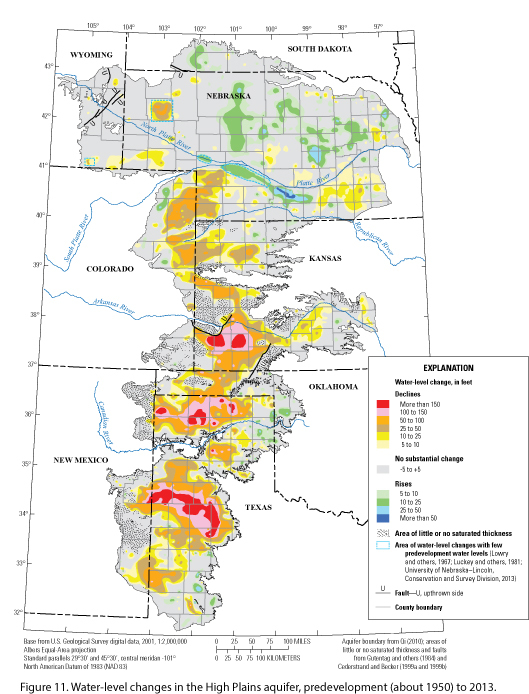 Water-level changes in the High Plains aquifer, predevelopment to 2013. From McGuire, 2014. (Click image for larger version).